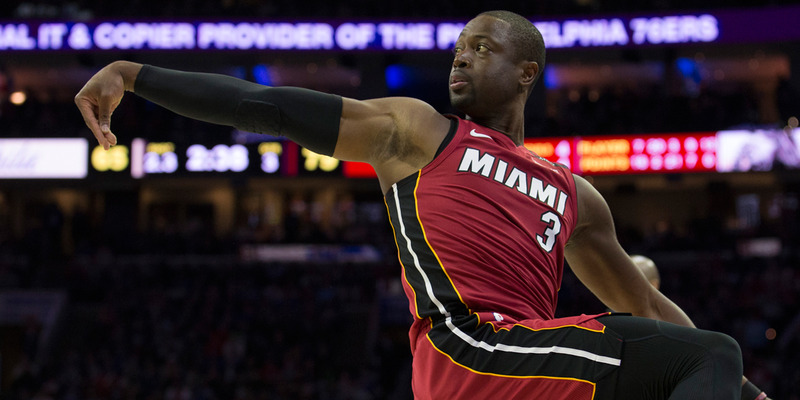 Mitchell Leff/Getty ImagesDwyane Wade came off the bench for the Heat, but dominated up and down the court, leading Miami to a113-103 win over Philadelphia. Dwyane Wade put on a vintage performance on Monday night, leading the Heat past the Philadelphia 76ers in a 113-103 victory. Comedian Kevin Hart, who is a Philadelphia native and had been sitting courtside for the game, traded barbs with Wade throughout the night. After the game, Wade said it was Hart’s trash talk that motivated him to go for such an impressive performance. Death. Taxes. Dwyane Wade hitting step-back jumpers in the NBA playoffs. The third of these three instabilities of life proved itself once again on Monday night as Wade led the Miami Heat to a Game 2 victory over the 76ers in Philadelphia. At 36 years old and 12 years removed from his first NBA championship, Wade put on a vintage performance against the Sixers, going for 28 points, seven rebounds, and three assists while making 11 of 16 shots from the floor, including a game-sealing jumper in the closing minutes of the game to even the series with Philadelphia 1-1 as the two teams head back to Miami. He did all of this coming off the bench in just 26 minutes of action. In what was likely his biggest play of the night, Wade forced a steal just as the Sixers had cut the Heat’s lead down to two points with just four minutes to play. Wade knocked the ball free and then the floor, slamming the ball home to put the Heat back up two scores. Miami would not look back. When asked about his impressive showing, Wade did not credit his vast amount of playoff experience, or any particular change in strategy for his fantastic game. Instead, he said it all came thanks to comedian Kevin Hart – a Philadelphia native who has taken the Jack Nicholson role of famous courtside fan for the Sixers and had rung the ceremonial bell in Philly that night to open the game. Throughout the game, Hart could be seen trading barbs with Wade, who would shrug off his verbal jousts before answering them with a jumper. After the game, Wade made sure fans knew that Hart was to blame for his dominance on the road. Wade’s back-and-forth with Hart even continued on after the buzzer sounded, with him telling the comedian that he would not be welcome in the arena when the series moved back to Miami. Hart wasn’t the only one shouting out Wade after the game. Wade’s wife, actress Gabrielle Union, had some words of her own for her superstar husband. Wade will in fact be going home as the series heads back to Miami knotted up 1-1. Game 3 is set for Thursday night.